My father got a job with AT&T after the military. My dad started out driving trucks and laying phone line. After a couple years, AT&T asked him if he’d like to go back to school to become a computer tech. I was probably four or five at the time. I remember taking apart and putting together computers with him. I remember him teaching me how to use DOS to find and play games. I remember playing Alley Cat with him. I remember when I was six or so. It was my birthday and my mom called me and asked if I would like to get my Power Wheels fixed for my birthday, or if I’d like to get this thing called Nintendo. The next day, my father and I were playing The Legend of Zelda. I would explore and fight while he filled in the blank map that came in the box. I remember being in middle school and playing games with my friends. I remember playing Final Fantasy VII and being shocked when Sephiroth killed Aeris. I remember playing Metal Gear Solid: II and being blown away by the fact the Psycho Mantis would read your Playstation memory card and the characters would break the 4th wall and tell you to turn off your game. I remember being in high school and setting up Starcraft LAN tournaments with my wrestling teammates after practice. I remember being so good, we would enter local tournaments and roll kids. I remember playing Counter Strike with a team someone cobbled together in their dorm room at St. Joe’s and the first time we played kids from another college. What I am saying is when I think about video games, I remember all the good times I had with people I care about. It is all about the experience. That is why the highest form of gamification, what I call stage 3, is using video game techniques to create experiences for students. Specifically, the transmedia, networked narrative that video games do so well. This year I’m applying these narrative mechanics to my makerspace. Over the summer, I reimagined my Innovation Lab. I see students once every six days in the Innovation Lab. Previously, students could pick a project that interested them from a group of projects and work in teams to complete them. I found that students often forgot what they were working on since I only saw them once every six days. I also noticed that my kids didn’t stretch themselves. They stayed in their comfort zone. Kids who liked coding stuck with coding, kids who liked engineering stuck with engineering, and kids who liked the digital arts stuck with the digital arts. They also only worked with their friends. Things had to change. After some brainstorming, what I decided to do was make one hour STEAM challenges that students would work on and finish each class. I also decided that students would have to work with diverse teammates in an effort to develop their team work skills. When I started to think about how to package and explain all of this to students, I went back to gamification as I always do. How could I turn these one hour challenges into an experience? I turned The Innovation Lab into a game show. 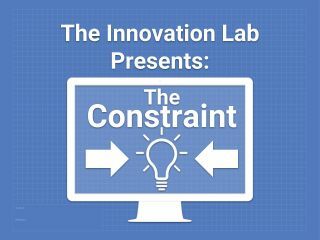 The Innovation Lab presents the world’s most popular classroom game show: The Constraint! Imagine a makerspace meets Iron Chef: each week student-contestants compete against the clock and each other in one hour STEAM challenges on The Constraint. As the host, I start off by introducing the challenge for the episode and walk students through our design process as they try to complete the challenge. First we define the problem, then we imagine a solution. Finally we make and test our ideas and wrap up with our closing reflection question. All of the fun is captured on four different camera setup around The Innovation Lab. Like the name suggests, students have to be aware of the constraints of every challenge and have to be innovative in how they approach their solutions as the solution isn’t spelled out for them. My kids’ solutions have come in many shapes and sizes. If my 4th and 5th graders successfully complete the challenge, they earn one point for their class. Our leaderboard shows what class is in first place and who is leading in the grade vs. grade competition. Two weeks into the game show, I’m seeing better behavior and focus since everything is timed and the kids love that I’m streaming to a private (maybe one day public) YouTube channel. At the end of the six day cycle, I chop the stream up into a mini episode the captures the best parts of the week. Students have loved to see themselves or their friends competing on The Constraint. So far, things have been going well. In a survey, they’ve overwhelming said they are having fun which is awesome because fun is an important part of keeping kids interested in STEAM. In the future, I plan to turn over the editing of The Constraint to my FH Gizmos students and I’m planning to tap into what students are learning in class and turning it into challenges they’ll face on The Constraint. Right now, the projects are engineering based, but we will eventually make our way to computer science and the digital arts all while keeping design thinking as the backbone of the class. Below I’ve included an extended cut of our first episode. In this video you can see a little bit more of what the The Constraint looks like incase you want to try this at home. Two weeks in and after watching the video and surveying students, I see a lot of room for improvement. But, overall, the game show experience that I have created has been a big hit and has helped me overcome some of the obstacles I’ve faced previously in The Innovation Lab. Fun fact: you’ll notice I switch from a marshmallow having to be on top of students’ towers to a lego man having to be on top. Students decided to use marshmallow instead of tape to build there towers. The Innovation Lab was covered in marshmallow, so I had to remove them. I should have known better!